As a parent, your primary concern is for your child’s safety. One of the first places you can address this concern is in your baby’s nursery. Often, new parents purchase furniture items that pose potential health risks. There are a few helpful tips you can follow to ensure you are not jeopardizing the safety of your child due to your choice in furniture. 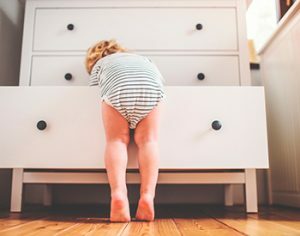 From watching out for formaldehyde and other chemicals to avoiding plastic containers for toys, you can take these steps prior to moving your child into his or her nursery for the first time. You do not need to have an extravagant budget to purchase baby safe furniture for your child, nor do you need to spend hours searching through specialty shops. Remaining conscious about your choices and ensuring the products are made of safe materials can be accomplished even if you are trying to save money. More in-depth information about purchasing safe baby furniture is covered below. Breathing in formaldehyde can cause harm to your baby, as it is a known carcinogen. Formaldehyde can cause irritation to your baby’s nose, eyes, skin and throat. When you are selecting furniture, be sure to carefully read the material list to determine if formaldehyde has been used in the construction process. If it is found in the material list, do not purchase this item and continue to seek furniture options with safer adhesive materials. Another material you must avoid when buying furniture for your baby is known as polybrominated diphenyl ethers (PBDE). These ethers are commonly found in foam-based furniture items such as baby mattresses and couches. This material is flame retardant, which is why it is typically used in the construction process for many household items, including televisions and computers. If you are purchasing a mattress pad for your baby, be sure to check for PBDEs in the material list for your selected item. This material is known for shedding a layer of dust that can be ingested by infants and be harmful to their health. The Center for Disease Control and Prevention (CDC) has found the highest level of PBDEs ever recorded in a human’s system have been found amongst infants and toddlers. Be diligent about checking whether this material is used in the furniture you purchase for your child to ensure you are not exposing your baby to this toxicity. After you have looked through the material list for the furniture items you are interested in to ensure they are free form formaldehyde and PBDEs, you can begin to find baby-safe options for your nursery. Unfinished wood furniture is the safest option you can buy when looking for furniture for your baby. Cribs constructed of solid unfinished wood are typically free from harsh chemicals and toxins and are safe for your children to use as they grow into toddlers. If you decide to paint your wood furniture before placing it in the nursery, be sure to select paint free from toxic chemicals. Non-toxic, water-based paints are the safest options when painting a crib for your baby. As your child continues to grow, he or she may become accustomed to gnawing on the sides and top of the crib, which can prove dangerous if you have selected a paints with many volatile organic compounds (VOC). When choosing your paint options for your baby’s room, select from milk paint or non-toxic latex paint options. These are the safest for your child, as even low-VOC or no-VOC paints can still prove harmful. Solid wood furniture can be expensive, so if you are looking to buy furniture on a budget, there are other options available to you. When you are buying baby furniture online or in person, you can seek out formaldehyde-free furniture from most leading brands. Formaldehyde-free furniture is available in various styles and items and do not break the bank for conscious parents who must remain on a tight budget. You can also find affordable and safe bedding for your baby while you are in the process of purchasing MDF furniture. When selecting upholstered items for your baby, choose from options constructed of wool or organic cotton. These materials are safe and are often included in items such as mattresses and chairs for a nursery. Woven baskets made of natural materials. Durable boxes made of cardboard. Many leading retail suppliers provide a variety of baby-safe storage options for you to choose from. Storing your child’s items in any of these natural materials can prevent any potential harm from arising if your baby tries to put his or her mouth on one of the toys or the storage bin itself. In addition to being safer for your baby, storage options such as canvas bins or leather boxes are often easy to clean. You can simply wipe down these containers with chemical-free products to preserve the quality of your storage without jeopardizing the health of your baby in the process.